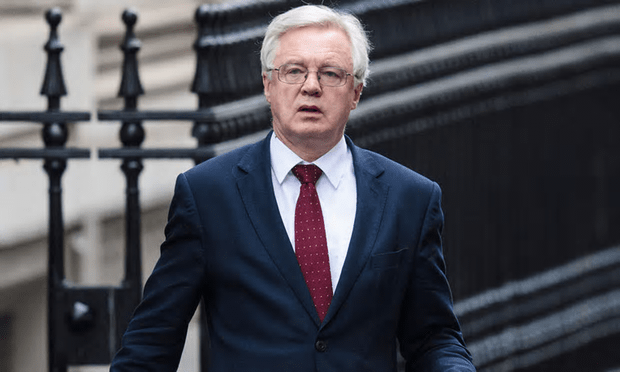 David Davis was set to address the Commons shortly after midday on February 2. It came as Labour said it would fight to stop a ‘reckless Brexit’ [Image: Jack Taylor/Getty Images]. More interesting than publication of the Tory White Paper will be Labour’s reaction to it. It is now abundantly clear that all the knee-jerk critics who wanted us to believe Labour would wave the Tory Brexit past Parliament without standing up for the people were completely wrong. Labour’s plan is – and always has been – to make sure the Tories can’t do whatever they want, but must accept their responsibility to the United Kingdom, to do what is best for all the people, not just the rich. John McDonnell seems to have suggested abstentions, which is the best Labour can do after voters called for the country to leave the EU. As a democratic party, Labour must support the will of the people, as demonstrated in the referendum. I know some critics are still holding out that it doesn’t count because the whole electorate didn’t vote but their argument falls because the opportunity had been provided. But Labour has done that, by supporting, in principle, the Bill that confers power to trigger Article 50 on Theresa May. We now come to discussion of the practicalities. If the White Paper shows the Tories intend to betray the people, and the Opposition parties are unable to push any of their amendments onto the Bill, then it seems the only option will be to oppose the Bill in its current form or abstain. Abstention may be the more attractive choice as it says the Opposition parties accept the referendum vote but not the Tory plan. David Davis, the Brexit secretary, will present MPs with a formal policy paper setting out how the UK proposes to leave the EU, a day after MPs voted in favour of giving Theresa May the power to trigger article 50. It comes as John McDonnell, the shadow chancellor, promised that Labour would fight against May’s pursuit of a “reckless Brexit” after the party was whipped in favour of giving her the power to trigger article 50. Jeremy Corbyn’s closest ally said Labour would not give the prime minister a “blank cheque for what others call a hard Brexit and I think is a reckless Brexit”. “We are all uncomfortable with the position, we campaigned to remain, but we are democrats and have to respect the will of the people,” he told BBC Radio 4’s Today programme. This isn’t a tory Brexit, the people of the UK voted to leave the eu entirely, no hard or soft nonsense was involved in that vote, and people from every party, despite what the press and some party activists try to say, came from across the political spectrum. So far I haven’t seen remain voter May pursue any sort of brexit, let alone a reckless one. Who is this we who campaigned for remain after all they came from across the political spectrum just as leave did, to try to make this a party political debate, despite the majority of votes to leave coming from labour dominated areas, is a rather worrying example of how far some of the labour party mp’s are from their base electorate, in their views. Brexit is a very complicated issue.When the EU(the then EEC) was formed immigration was not an issue, because Member States made decisions on such issues.Now for example, immigration laws are being evaded in the name of “free movement”! Labour has chosen to accept the outcome of the regerendum as ‘the will of the people’ and not to join in what would be a forlorn attempt to prevent Article 50 from being triggered. But as it becomes apparent during negotiations that the ‘best deal for Britain’ will be a very bad deal indeed, as Scotland and possibly Northern Ireland shape to leave the UK, as Brexit-related inflation starts bite into the budgets of the less well off, the “people’ (ie, the 34% who voted Leave) may start to have second thoughts. Labour’s task will then be to oppose both the deal (which will be untruthfully spun as excellent) and the no-deal alternative, and champion a second referendum with the object of reversing the outcome of the first.